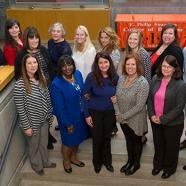 Recognizing that effective leadership skills are vital to their responsibilities, RIT and Rochester Regional Health inaugurated a year-long Nurse Leadership Development Program designed to elevate the leadership potential of selected candidates. The curriculum was customized by the Executive MBA program at RIT's Saunders College of Business. It allows participants to earn 16 credit hours toward an Executive MBA (more than one-third of the requirement) and a certificate of program completion from RIT and Rochester Regional Health. "As hospitals and health systems face resource constraints and changes in both health care policy and patient care delivery, it is critical for our nurse leaders to hone their operational and leadership skills," said Dr. Eric Bieber, president and CEO of Rochester Regional Health. "We believe this program is invaluable to that cause." According to Jeffrey Davis, associate director of the Saunders College Executive MBA program, the curriculum is a combination of existing courses and those that were developed especially for the nursing professionals to advance their skills in healthcare operations, strategy, data analysis, leadership and coaching, and critical thinking. "Rochester Regional Health has thousands of nurses in the whole system and these are the individuals who lead them," said Davis. "The students in the program are quite impressive: We have directors of nursing, an emergency department manager, operating room manager, chief nursing officers, director of acute care services and a director of clinical education." The 16 nurse participants in the program were selected by a committee from the Rochester Regional Health system which includes Rochester General Hospital, Unity Hospital, United Memorial Medical Center, Newark-Wayne Community Hospital, Clifton Springs Hospital & Clinic, and Long Term Care. Kristin Opett, vice president and chief nursing officer at United Memorial Medical Center, said the classes at RIT have been "phenomenal," and that adding business and operational skills to her leadership portfolio have been most beneficial. "The classes help shift our thinking from traditional evidenced-based models to more of disruptive innovation needed in today's healthcare environment," said Opett. "Additionally, the focus on leadership development, conflict resolution, empowerment and engagement are all critical to successful leadership. This program is setting us up for 'real life' work and challenges." Putting learning into practice, the nursing students completed the program by working in teams on a 15-week capstone consulting project which they presented to the Executive Leadership Team of Rochester Regional Health in November. Rochester Regional will later evaluate the program to determine the next steps.